This is a shame of course because Hostas are hardy and blend nicely with tropical effect foliage. 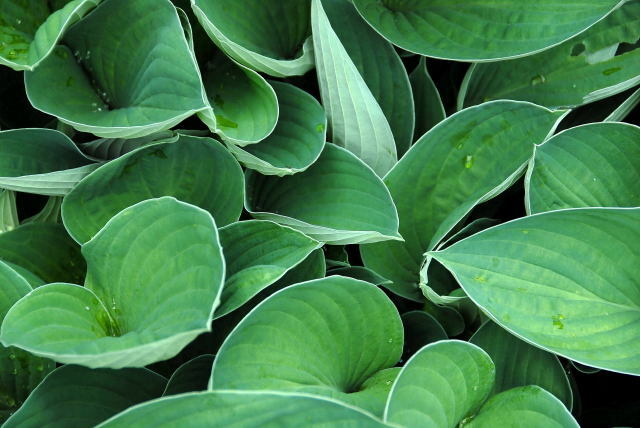 It is possible to keep Hosta foliage pristine when grown in the soil but it takes a lot of effort. You either need to surround them with a carpet of slug pellets which is fairly unpleasant for all those involved or use any number of organic pest control methods. The majority of organic slug and snail control methods only work when it is not raining which of course is when the slugs (or snails) are taking a nap. Even if you go to great lengths to deter the slugs and snails, it only takes one intrepid slug (or snail) to make a right old mess of things. 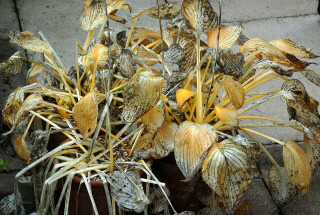 As Hostas only produce their leaves in one go, you need to wait until next year for the plants to look good again. For some reason slugs and snails hate copper. 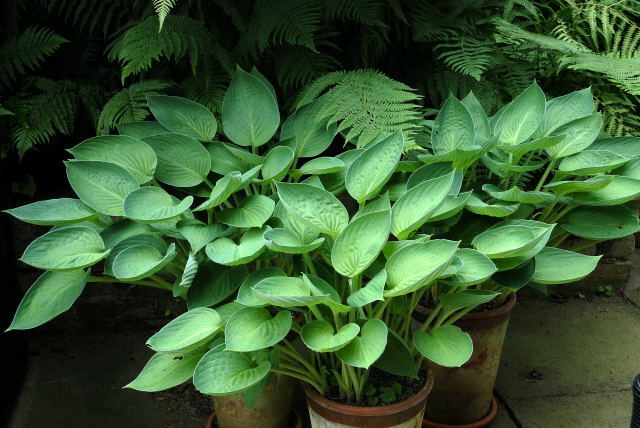 This can be used to your advantage when growing Hostas in pots. 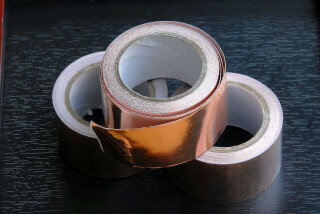 Copper now comes in convenient self adhesive tape. 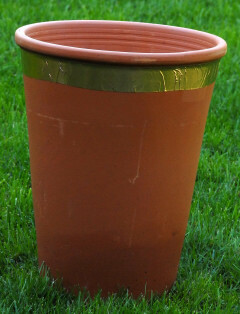 The copper tape can be stuck to the out side of your flower pots to prevent slugs and snails from getting close to your Hostas. As long as no part of the Hosta comes into contact with anything that could provide a bridge across for snails (or slugs) your Hostas should remain in good condition all summer. However it is important to be vigilant as sometimes, despite your best efforts, a snail may find its way into your plants, the obvious give away being the appearance of holes in the leaves. If you notice any signs of damage, water the plants just before dusk and then inspect them again after it gets dark. You should find any stowaways quite easily. When starting out with new plants you can simply plant them up in the flower pots. 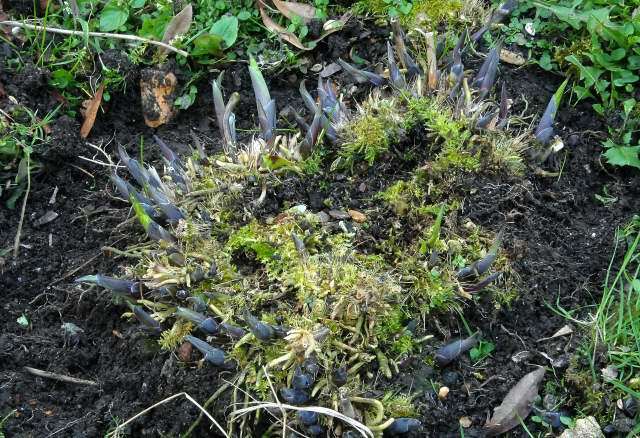 If your hostas were previously planted in the ground you will need to dig them up. 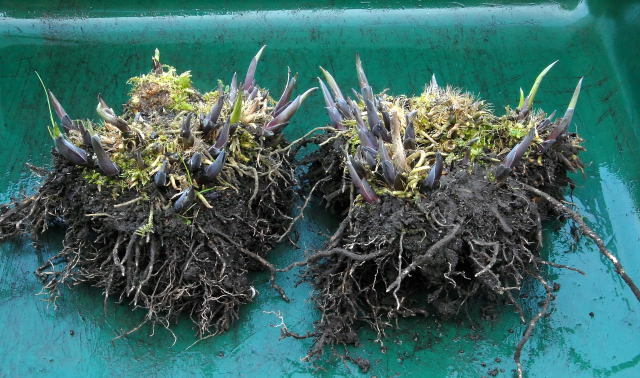 The best time to lift and divide Hostas is just as they are starting into growth. Dig up the clump in one go. Divide the clumps as necessary so that they will fit into the chosen flower pots. Allow a little extra space for the plants to expand into. When digging up plants from the garden it is important to inspect them for any baby slugs or snails at the time of planting and for the next few weeks. 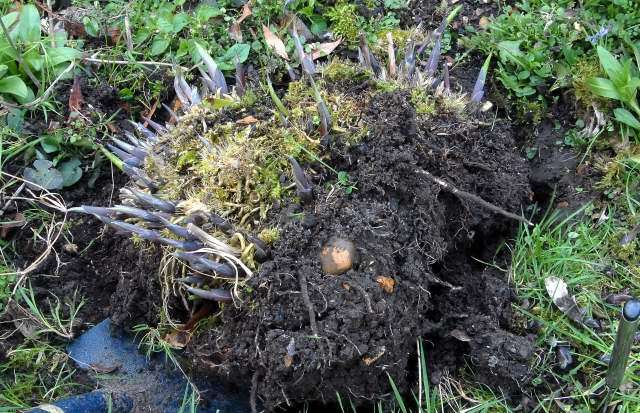 The soil may also contain slug or snail eggs which will not be apparent initially. The Hostas are planted up in loam based compost and top dressed with grit. Several weeks later the copper tape has managed to protect the hostas from slugs. However it can be seen in the above picture that the advice given out further up the page was ignored. When the potted Hostas were initially placed in their current position the ferns had not yet unfurled completely. Later on in the summer a snail did indeed manage to crawl out onto the Hostas and cause considerable damage. 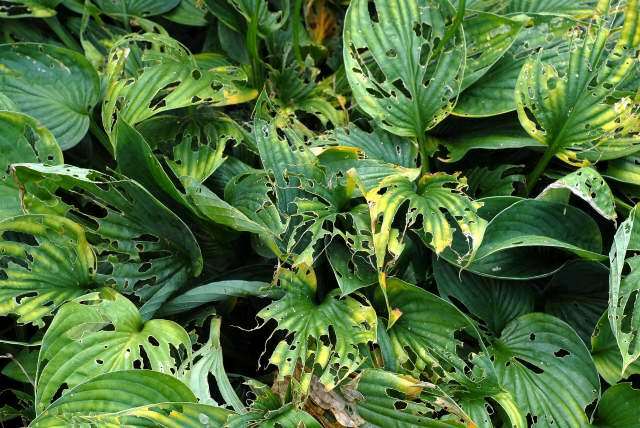 A slight disadvantage of Hostas is that they have a tendency to die back before the frosts come. If you are growing Hosta within the border this habit can look quite messy relative to any surrounding tropicals. 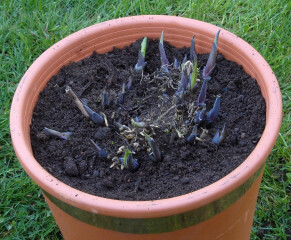 Another advantage of growing hostas in pots is that they can be moved out of sight once they have passed their prime in the autumn. Cut back all the old foliage to prevent anything climbing aboard and stowing away for winter. 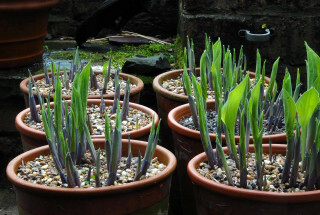 Re-position the pots once again in the spring so as to enjoy the new leaves emerging. This technique does not have to be restricted to growing Hosta. Any slug/snail prone plants can be grown in this way. In fact it is quite a good way to grow any number of flowering perenial plants within a tropical border. This protects the plants when they are dormant while you may be digging around lifting tropical plants and otherwise trampling all over them. It raises the overall height of the plants. It also gives you flexibility as to where you place your perenial plants within the border.